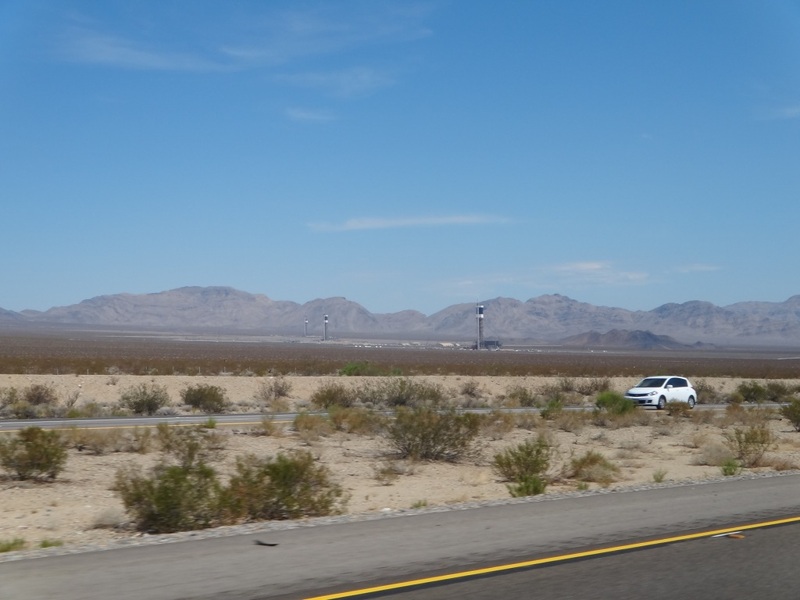 Photograph 1 - About half way between Los Angeles and Las Vegas - the Mojave Desert, California. Photograph 2 - Leaving California and entering Nevada. 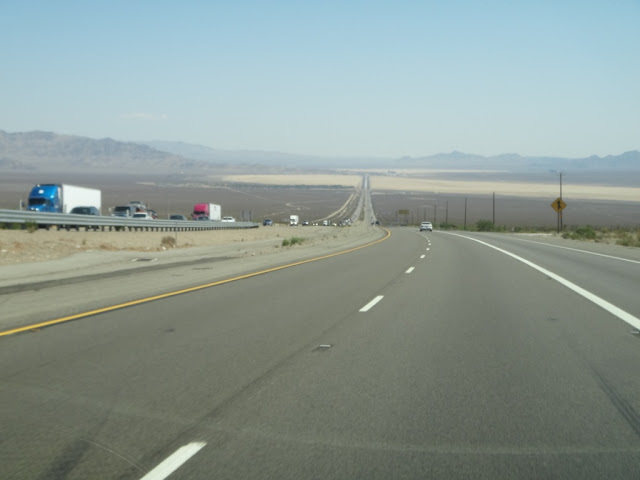 The I-15 just travels on and on. Note the salt lake in the background. Photograph 3 - At the state line between California and Nevada - what are these strange searchlights in the desert? There are actually three towers? Photograph 4 - Entering Las Vegas from the west. The tall buildings in the background are casinos and hotels - about 12 kilometres away. 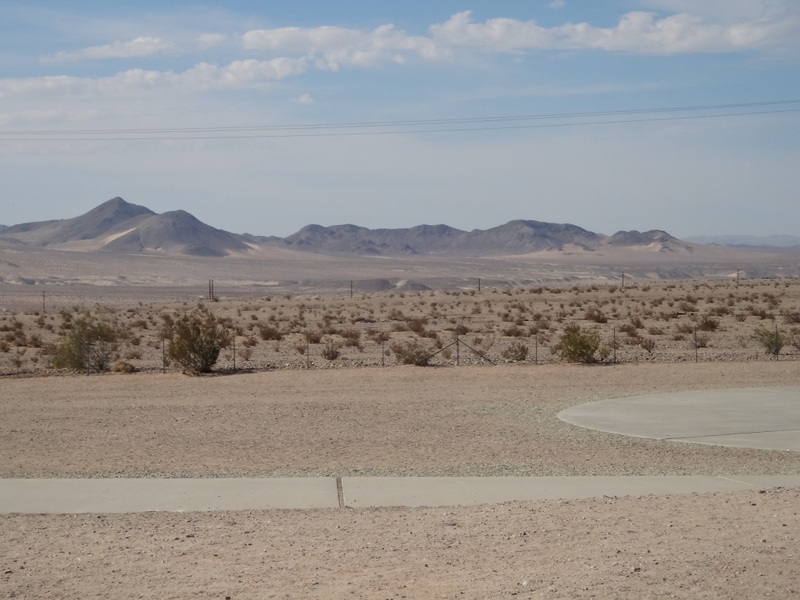 From this location they look about a couple of blocks away, however, the desert atmosphere makes them look closer than you think. Photograph 5 - Our accommodation is on the top floor (Floor 38) of Tower 3 Signature Hotel. 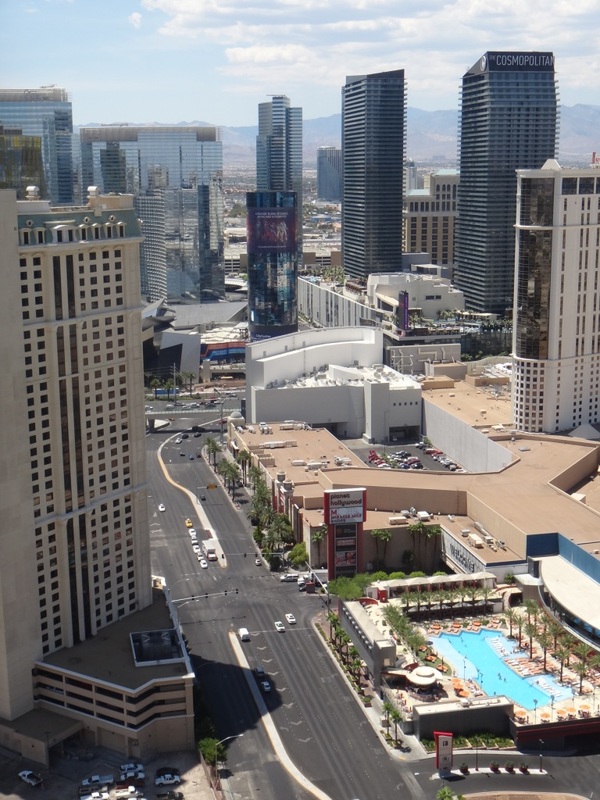 This is the view looking towards the Strip in Las Vegas. Interestingly, the temperature at this time was 120 deg F. Convert that into Celsius it's 49 deg. The city is actually baking! 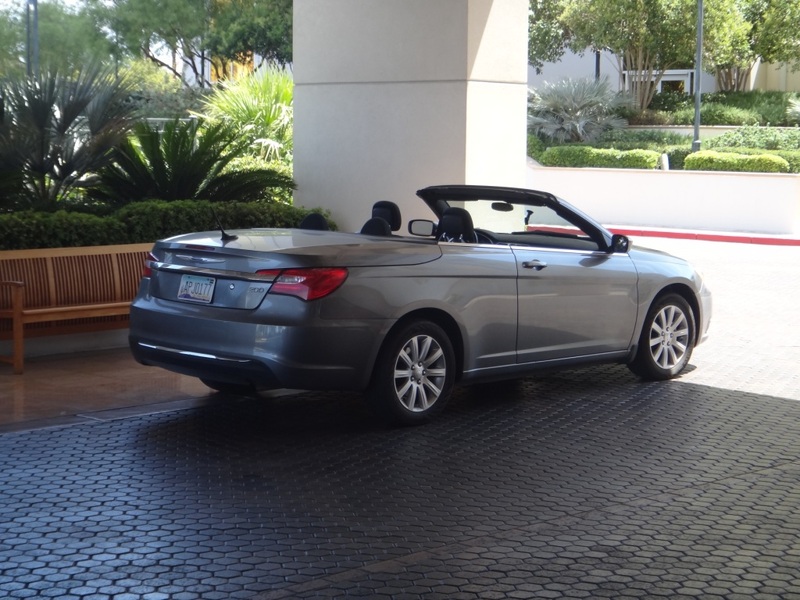 Photograph 6 - Our Connie at our Hotel in Las Vegas. Within a few hours she was returned to Avis. Photograph 7 - Handing Connie back to Avis at the depot. Also Anne is looking quite sad in parting with her. We collected her 32 days ago with nearly 6,000 miles on the clock. When we handed her back it read just over 15,000 miles. Boy we did some miles. On another note, check out Anne's shopping bag - it's full of new clothes.........again. We left at 6:30am today to try and beat the Los Angeles rush hour. Well - we did it without any fuss. 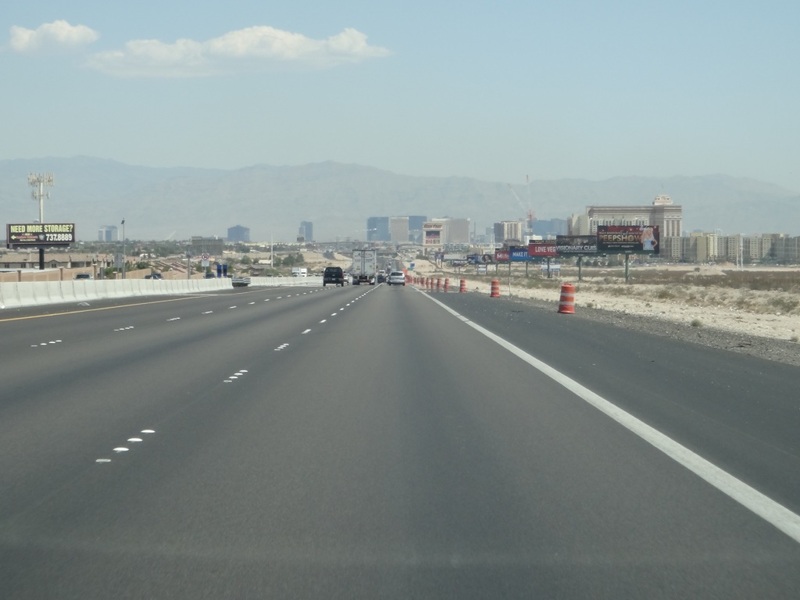 Charlotte put us on the I-15 which is near our hotel and the expressway went through the centre of LA on to Pasendena and headed north to Las Vegas. The traffic was light on and we averaged about 100 KPH along this entire section. In other words it was okay. We expected to take 7 hours to Vegas but it only took us 4 hours 15 mins. We arrived about 11am....so we visited Wal-Mart and spent a bit of time there buying all sorts of stuff that we can't get in Australia. Anne cannot believe that her make-up that costs $50 AUD in Penrith, cost only $10 USD here. From Wal-Mart we checked-in to the Signature Hotel in Las Vegas (for the third time this holiday) and was given the top floor apartment in the 3rd Tower - and what a view? 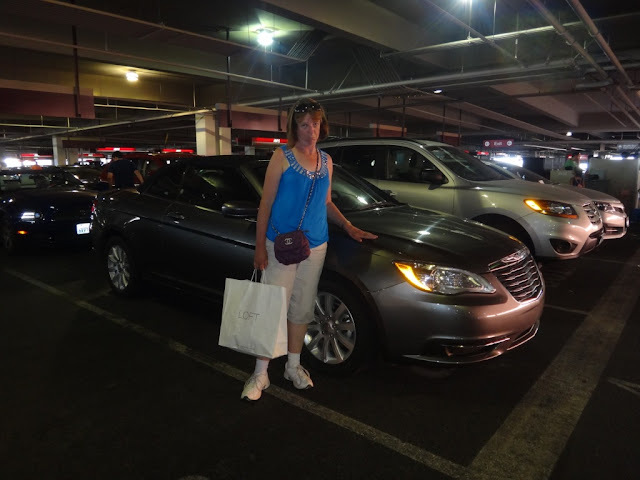 Since we still had Connie for a few more hours we drove to the Premium Outlet north of the city where Anne hit Ann Taylor fashion store with zest. We were due to hand Connie back to Avis by 6pm and with a few hours to go we refueled her and gave her a vacuum and wash.... she looked great. When we handed her back it was a sad moment. We were quite attached to this vehicle. Connie never faulted in her travels, was never abused, been involved in all sorts of heavy traffic in Salt Lake City, Seattle, San Francisco and Los Angeles but the best thing that her high miles per gallon was excellent fuel economy. Well we are now in Las Vegas for three nights wondering how we going to fit everything in our suitcases. It will be a couple of days just relaxing and finishing off our shopping before our flight to Honolulu on Friday. Lastly the temperature actually reached 120 deg F here in Las Vegas - that is 49 deg C in our language. Since there is no humidity here the heat was hot but not that bad - we just needed to drink a lot of water. Cheers.